What do you do when your reliable and safe vintage Volvo wagon doesn't quite do it for you anymore? The builder of this beast of a brick turned a sensible Swedish wagon into a 'merican powered muscle car. When you see an old car for sale, there is often a claim of rarity or the fact the car in question is one of a kind. More often than not, the claim is a gross overstatement. This is one of the rare occasions where it is not. 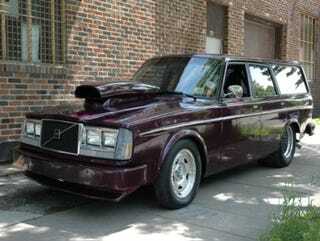 What you are looking at is a 1978 Volvo 245 Wagon that has had the "Pro Street" treatment from front to back. Regular weekend readers might remember the Mercedes Benz 240 which had also received the "Pro Street" treatment we saw a couple months ago. Not quite a drag car and not quite a street car, we though the Benz would hold the most unlikely vehicle modified for strip and street use title for some time. That all changed when we stumbled across this Swedish wagon on Ebay with a freshly beating American heart. If you live in the land of 10,000 lakes and have some free time and fabrication skill you might opt to turn your old wagon into a fire breathing muscle car sure to turn heads when it shows up anywhere. That is exactly what the person who built this wagon decided to do. The Volvo now features a 410 horsepower 350 Chevy V8 under the hood where a small 4 cylinder once lived. To accommodate the significant boost in power from the stock engine, various modifications have been made to the wagon. These include adding a custom rear sub frame, along with an upgraded Chevy rear end and transmission. Perhaps most importantly, an upgraded brake system was adapted from a Chevy to slow this wagon down as quickly as it can now accelerate. All of these modifications have left the Swedish manufactured wagon made up of quite a few Chevrolet parts, but the modifications don't stop there. The most obvious modification to the wagon visually, besides the hood scoop, is the addition of wheel tubs to accommodate the huge rear tires that now sit underneath the back end of this beast. Our guess is upgrading to the huge rear wheels is the only way to keep a 410 horsepower V-8 with a big bottle of nitrous going straight down the road. Additionally, Volvo diehards will notice that the front sheet metal was replaced with a newer model's at some point in the wagon's transformation. According to the seller, all the Volvo needs "nothing but a cup of latte in the cup holder" The car "Comes with a full tank of gas and a lot of attitude" and is "Not for the feint [sic] of heart." If you have $18,995, you could be the one supplying the latte and holding on for dear life in a 245 wagon that is truly "one of a kind".